Sources for this post included historic San Diego newspapers and the 1984 book, The Little Old Bonsall Schoolhouse by Virginia Funk. “QUICK TIME—THROUGH BY STAGE FROM SAN FRANCISCO TO SAN DIEGO IN LESS THAN THREE DAYS,” was the headline on an item in the “Local Intelligence” column of the San Diego Union on September 26, 1872. Sources for this post included historic San Diego newspapers and the book, City of San Diego and San Diego County: The Birthplace of California, by Clarence Alan McGrew, published in 1922. Flash! Request for Reader Comments! 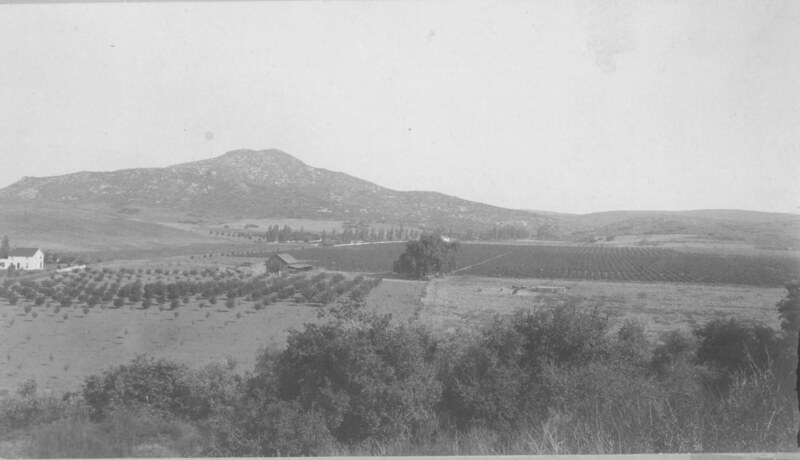 We interrupt our regularly scheduled programming for a request for more information from some of you readers out there, especially people from the Poway Historical and Memorial Society or anyone familiar with the history of Poway. The photo below, of the Horace Kent ranch, circa 1900, originally appeared in my blog post of January 12 of this year, “Going Over the Grade.” It’s brought a lot of interesting comments which I’m happy about. I’ve replied to all the previous ones but the latest, received this morning, asks about the possible owner of another house in the photo and just where the photo was taken from. I don’t have that info but if anyone out there might have the answers you can go to the original post and reply to the questioner. The original post was on January 12, 2015. Use the archive index on the home page, click on the month, and scroll down to the post and the “Comments” section. Thanks to all for the discussion! Before it was the name of a hotel chain, a ramada was an open-air shelter used by Native American families during the daytime. 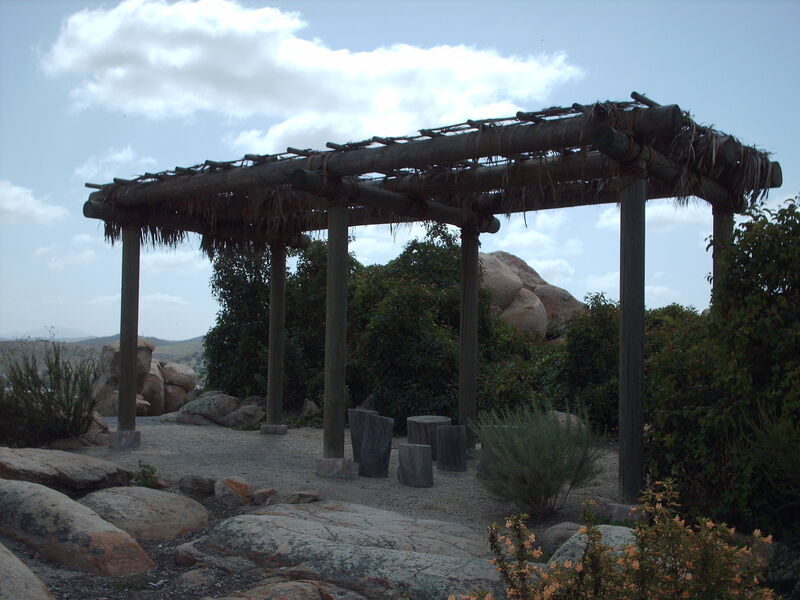 Below is a replica of a ramada, constructed of natural materials, at the Kumeyaay Ipai Interpretive Center (KIIC) in Poway. (Photo credit V. Rossi) The center, in the heart of Poway, preserves the site of a village inhabited by the Kumeyaay, the original residents of this county going back some 2,000 years. During the heat of the day, a Kumeyaay mother might do some food preparation or basket-weaving under this shelter while watching her small children. Actually, there may be more of a historical association between the word “ramada,” and the resort idea than most people realize. Here’s what I mean. Judge Benjamin Hayes, a lawyer originally from Maryland, moved to California in 1850 and began a career that made him a district court judge and general mover and shaker in southern California politics. In 1867, Hayes wrote a letter to his brother-in-law about a visit he paid between court circuits to the area we now call Warner Springs. This area was originally called Kupa, after the indigenous people who first settled it. That was not what they called themselves, but remember what I said a couple of paragraphs back about that language thing. Sixteen years before, in 1851, the native people, after enduring decades of oppression and cruelty, first at the hands of the Spaniards, then from their Mexican and Anglo successors, staged an uprising. The revolt ultimately was put down, but it resulted in the recognition of some rights for the indigenous people over the springs area, at least for a time. The Indians well recognized that value, as Hayes pointed out. The people we today know as the Cupeños would lose their springs, and their home village. They would eventually regain them, but that’s too much history, sordid and triumphal, to portray in one or two blog posts. I would urge readers interested in the history of San Diego County to visit KIIC and the Cupa Cultural Center. For more information, including hours, visit the KIIC website at http://www.friendsofthekumeyaay.org/ and the Cupa Cultural Center’s website at http://www.palatribe.com/cupa-cultural-center . Sources for this post included historic San Diego newspapers and two pamphlets, Introduction to the Cupeño People, published by the Cupa Cultural Center, and Cupeños Trail of Tears, by Milford Wayne Donaldson on behalf of E Clampus Vitus. The latter pamphlet was published to accompany the dedication of a commemorative plaque at Warner Springs Ranch in 2003. Side by side with notices about Easter worship and cultural celebrations were notices about Passover.